RATES ARE BASED ON FULL HOUSE BOOKING FOR UP TO 9 GUESTS (4 COUPLES). The ultimate getaway close to Margaret River's main beaches. The beautiful formal gardens set on 8 acres that sweep down from the terrace, past the pool deck and onto the lawns below all with a view across the Leeuwin Ridge to the Indian Ocean provide the spaces and ambience for a beautiful relaxing and memorable getaway. The house was architecturally designed and built about 15 years ago for a Balinese princess, striking minimalist design, glass floor to ceiling windows everywhere accentuated with Balinese design and décor. The second floor hosts the Master bedroom with ensuite marble bathroom, shower & bath with views to the Indian ocean. Two guest bedrooms with ensuites each with views across the estate to the Leeuwin Ridge. Privacy is assured from every aspect of the property. Standing on the Leeuwin Ridge overlooking the Indian Ocean is the Princess House Margaret River. The Princess House is fully self-contained and provides all the comforts and facilities you would expect from luxury accommodation. 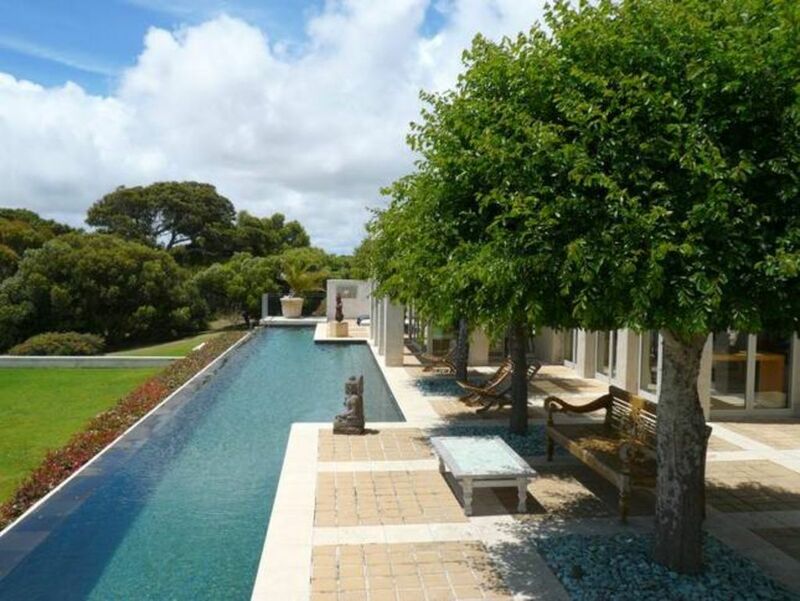 Set in a quiet location, this superbly appointed large mansion features 3 bedrooms, 4 bathrooms, gourmet kitchen and entertaining area by the 30 metre infinity lap pool with uninterrupted forest, garden, river & ocean views. Managed for the overseas owners, guests will be met on arrival for key handover. Located only 15 minutes away from Margaret River's town centre with a variety of shops, cafe"s, restaurants and galleries to enjoy. We are also minutes to surf and swimming beaches, the river mouth and golf course, a short drive to Leeuwin Estate, Voyager Estate, Watershed wines, Xanadu Wines are just the start to the trail that continues along Caves Road to the heart of the famous Margaret River wine region and major attractions . 1 Queen bed in Granny Flat. Fully equipped stainless steel kitchen, indoor dining room, living room and TV room. Outside granite dining table with BBQ. and lounge chairs by the lap pool. Circle driveway, garage for two cars and private parking for guests. Quality furnishings & finishes throughout. View our photo gallery to see the numerous defining features of this property that will make your stay special. We stayed at the home for 2 nights for my Dad’s birthday weekend. The location and surroundings of the property were amazing! Carl provided some food and wine on arrival which was lovely. However, we were very disappointed with the lack of cleanliness of the home. There was used dishes in the dishwasher and the kitchen stove exhaust fan and light did not work. The master bedroom smelt like cigarette smoke, and there were stains on the donna cover. The granny flat had not been vacuumed either, with balls of hair on the floor, and cigarette filters in the cutlery draw. My brother even found a piece of glass in the bed sheets whilst attempting to sleep in the granny flat. There was a packet of Panadol and personal belongings left outside near the pool. Multiple doors downstairs which opened to the pool were not able to be closed properly and were shut with pavers, luckily we had no small children with us during our stay. It also meant we weren’t able to fully lock the house up when we left for daily outings and wine tours. The couches where very uninviting and we found most of the furniture dated and requiring an update/clean. Needless to say, once we arrived we started looking for somewhere else to stay in Marg’s, but with no luck at such short notice. After messaging the owner and listing the problems we were even more disappointed with the lack of understanding. For the price we paid, we wouldn’t stay here again and wouldn’t recommend to family or friends. Beautiful grand architectural home with amazing views over the infinity pool and down to the ocean. We loved our stay in this stunning light filled property with the 6 acres of garden and total privacy. The massive entertaining area overlooking the pool was perfect for our family. We started every day with a swim with family breakfast looking out on the ocean, the sun pours into the dining area and in the evenings the kids would swim at sunset and we would cook on the BBQ outside, the outside living dining area is large and great seating for sunset viewing. Night time the milky way reflects off the infinity pool. We are avid bird lovers and we have never seen so many birds mainly active in the early morning and evening sweeping down and drinking from the pool. Magpies joined us for all meals sometimes sitting on the banana lounge with us. We all loved this wonderful home and location with the best wineries and best margaret river beaches. The Princess House comes highly recommended, you will not be disappointed. Big thank you to owner for being so helpful and accommodating, v much appreciated, we will come again. Thank you so much for your Review as the Princess House in the Last Year has had Major Upgrades as you can see from recent guests and you can view a new Drone Video of the Princess House on You Tube, under Margaret River that will truly show you the location and how special it is. Perfect for Weddings Celebrations and Birthdays, etc.